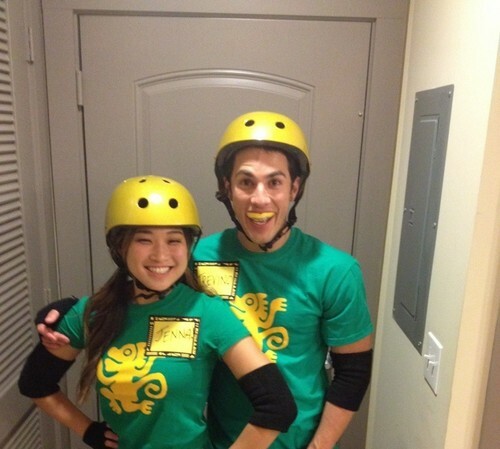 Michael Trevino & Jenna Ushkowitz matching 할로윈 costumes. . HD Wallpaper and background images in the 뱀파이어 다이어리 TV 드라마 club tagged: the vampire diaries michael trevino jenna ushkowitz halloween costume. This 뱀파이어 다이어리 TV 드라마 photo contains 헬멧, 충돌 헬멧, 타자 헬멧, and 타격 투구. There might also be 자전거 타는 것, 자전거, 사이클링, 오토바이 경찰, 오토바이 경찰관, 속도 경찰, 스피드 경찰, 경찰, and 속도 경찰 오토바이.